Welcome to Week 4 of the Hope for Hurting Hearts series. We’ve covered What To Do When You Feel Like There’s No Hope in week 1, and in week 2, we discussed What To Do When You Can’t See Hope. This week we move a little different direction: How to Bring Hope to Hurting Hearts. Many times I believe that Christians don’t minister to hurting hearts because they are unsure of what to say or do or how to respond. Because we are afraid of saying or doing the wrong thing, we do nothing. I can’t say that I know exactly what to say, or do, or how to respond in every situation either. But I do know where to go to get answers! This week, let’s take a look at our master example. What did Jesus say to hurting hearts? The man’s hand was instantly restored fully and appeared as the other hand. 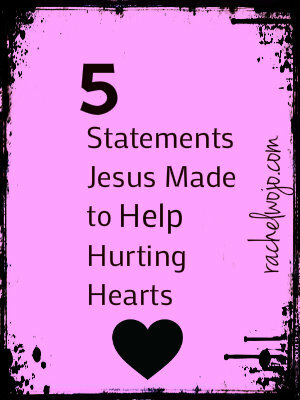 When we look at Jesus’ words to those with hurting hearts, regardless of their pain, whether physical, spiritual, or emotional, I see four beliefs we can learn to extend to hurting hearts today. 1. God loves you so much that He sent His Son to die for you; He wants to extend grace to you, His child. 2. Your faith in God is encouraging. 3. Jesus is with you; He has promised to never leave you or forsake you as His very own. 4. Healing comes when we obey the Lord; just take it step by step. What do you think about keeping the above four statements handy so that you have some go-to words when you don’t know what to say to a hurting heart? Or you could cut out slips of paper in advance with the above printed words, and simply pass a statement along to encourage a hurting heart. Could you leave an idea for bringing hope to a hurting heart in the comments below? I’d love to read and share them! -Many of our friends keep Selah’s birthday on their calendars and take a moment to remember with us each year. -I also had a special friend make a CD encouraging songs for us when we were up in the hospital. -Our neighbors gave us a framed print of a little girl walking with Jesus in Heaven and she looks just as I imagine Selah. Those acts of love (and many others that I shared within the post) were used by God to give us hope in the midst of the darkness. can’t wait to share it all!! Thank you for stopping by!! Good thoughts in this post. Thanks for sharing them. I think one of the most helpful things we can do when someone is hurting is listen, love them and pray for them. Very often, we don’t really have answers, but we can always say we are sorry they are suffering and we care about them. oh yes!! Excellent advice. We’re going to talk about not having all the answers next week! 🙂 Thank you so much for your comment. I adore I Peter 3:15 and it is my prayer to always be ready! I’m called on to pray for hurting hearts often and I ask God what it is that I have to offer that draws them to me. Simply, they know I’ll listen. They know I’ll pray. They know that if it ain’t coming from God’s Word directly, it doesn’t get said. I think that we have to be mindful not to insert our fleshly 2 cents in where the Word of God should be speaking. He’s the ultimate heart soother. I’m thankful for these verses that you posted and the encouragement to sit at Jesus’ feet and learn to minister to the hurting. I have a question and prayer request: How do we encourage a person with a hurting heart that doesn’t realize that its hurting (in the case of salvation…or lack of; and not thinking that there is a need for it?). I guess it could be praying for a softened heart? maybe? Oh girl. I know that ache. You want someone to turn to the right so badly, but they are completely numb and not listening, if you even make the effort to talk to them. Yes! I think you nailed it- pray for a softened heart. The Holy Spirit has the power to soften any heart!! I added you to my prayer journal, Kela. Thank you for your encouraging words. I am so blessed to have friends who just listen and say Sorry as Gail mentions. I have a tough road ahead of me that I have been traveling for 3 years and it looks never ending. Your verses are so strong and just what I need to know that with faith I will move through. People often tell me of their troubles bc I feel they know I will listen with compassion and pray for them. Thanks you for your words. Staying in contact to check in with how the person is doing is very helpful. I have a friend who has told me she is staked to me like a tomato plant is attached to a stake. This includes her friendship, prayers, presence, and hearing with her heart. I know she is because she asks pointed questions, shares what the Lord is revealing to her about our situation and family to encourage us and does make it a point to pray out loud with me. So often what she shares is the same as what the Lord has told me. So, it is also a confirmation for me from the Lord.